Mall of Georgia’s “Movies Under the Stars” includes live music followed by movie screenings on Saturdays from May 26 through July 28. Photo courtesy of Mall of Georgia. Pack a picnic, blanket and some bug spray, then head outside with the family to enjoy a movie under the stars this summer. 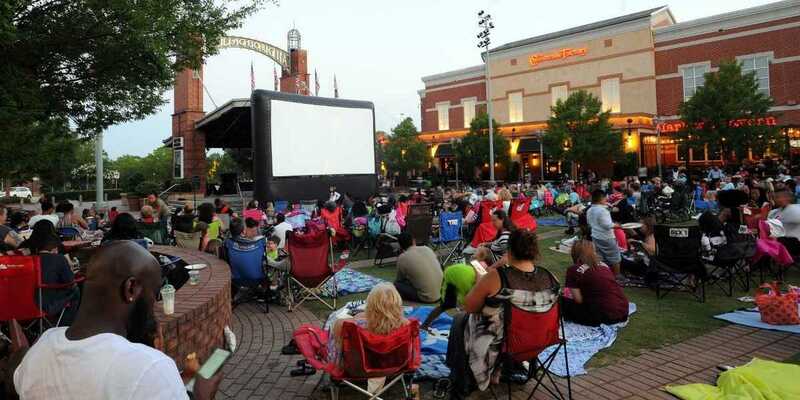 There are several free outdoor movie series throughout metro Atlanta to visit. Each has its own twist, from kids movies to throwback films from the early 2000s and even recent blockbusters. Generally you can expect the free outdoor movie to begin screening at dusk, and some locations offer pre-show activities and concessions. Most allow visitors to bring a picnic, but check before you go for restrictions on food containers and alcohol consumption. Blankets are common seating choices, but some allow lawn chairs (although sometimes only in restricted areas). In case of summer showers, check the social media accounts for the movie series for updates on cancellations and rescheduling. Cobb County’s family-friendly series takes place at several locations this summer, including Mable House Barnes Amphitheatre, Sewell Mill Cultural Art Center, Seven Spring Water Park and The Art Place Mountain View. It occurs on select dates in June and July with a new movie each week. “Jumanji” and “Wonder” and “The Greatest Showman” are a few movies on the schedule. Atlantic Station’s Central Park has a mix of films from the 2000s this summer. The park opens at 6 p.m. on Thursdays for the event with the films starting at dusk. You can see screenings of “My Big Fat Greek Wedding,” “Mean Girls,” “Pirates of the Carribean: The Curse of the Black Pearl” and more. Blankets and chairs are allowed, but watch for signs pointing to the designated seating sections for either. Another family-friendly series is Georgia Movies in the Park. This event boasts earlier, kid-friendly start times (often before dusk) than other series. For the event inflatable screens are set up in multiple historic, quaint settings OTP (Outside the Perimeter). There are activities like face painting for kids planned around the events. Guests are encouraged to bring a lawn chair and bug spray. The city of Duluth offers its movie series the first Friday of each month in conjunction with its Fridays-N-Duluth events that happen Fridays from 6 to 9 p.m. through September. Food trucks take over the downtown area, and live music fills the air from the festival stage. Billed as a community block party, there are also events for kids to enjoy before the films. See films including “Peter Rabbit” and “Coco” starting at dusk at the downtown fountain. When: May 26 through July 28, Saturday from 5 to 10 p.m. The Village at Mall of Georgia has a new 14-foot LED screen that will feature titles such as “Cars 3,” “Black Panther,” “Coco” and more this summer. Come early to hear live music from 5 to 7 p.m., enjoy kids activities, have a picnic and even purchase adult beverages if you are over 21. Movies begin at 7:15 p.m. When: May 26, June 29, July 21 and Aug. 11 at 8 p.m.
Blankets, chairs and picnics are welcomed for Roswell’s outdoor movie series. Guests can enjoy concessions and playgrounds as well. The event on June 19 is a special “Dive-In Movie” at the park’s pool!